When Prime Minister Narendra Modi, during the 'Satyagraha Se Swachhagraha' event in Bihar's Motihari district on April 10, congratulated the state government for building 850,000 toilets in a week, he, perhaps, missed a point: presence of toilets is not the only yardstick to measure sanitation status. If we look at the Ministry of Drinking Water and Sanitation's data for Barh block (which has Barh town, Bihar Chief Minister Nitish Kumar’s constituency), it becomes evident that the mission of ensuring 100 per cent household toilet coverage will be completed by April 2020—as opposed to 2051 previously estimated—considering the rate of construction remains the same as that of 2017-18. In Patna district, the rate of construction of toilets increased by three times, five times and 19 times in 2015-16, 2016-17 and 2017-18 respectively, in comparison to 2014-15 when Swachh Bharat Mission (SBM) was launched. At the current rate of construction, the mission of 100 per cent household toilet coverage will be achieved by October 2021. Similarly, in Varanasi district of Uttar Pradesh—where PM Modi’s constituency is located—the rate of construction increased by three times, 16 times and 44 times in 2015-16, 2016-17 and 2017-18 respectively, in comparison to 2014-15. At the current rate of construction, the mission of 100 per cent household toilet coverage will be completed by September 2018. The estimates in 2016 suggested that it would 100 per cent coverage can only be achieved by 2048. Down To Earth recently travelled to Gonda district in Uttar Pradesh and found that there, too, constructing toilets is the goal, instead of ending open defecation. About 100 kilometres east of Uttar Pradesh’s capital city of Lucknow, the district headquarter town of Gonda made it to national headlines in mid-2017 when it was named as the dirtiest city in India by the Swachh Survekshan rankings. Now with just one and a half years left to meet the Swachh Bharat Mission (SBM) target, the laggard districts are in competition to bring about 100 per cent toilet coverage, and Gonda district recently embarked on an ambitious drive. Christened “Mission 32”, the district targeted to build 32,000 toilets in just 120 hours between March 26 and 30, 2018. “This scheme will not only help us remove the tag of one of the dirtiest districts in the country, but will also serve as an exceptional example of efficiency, commitment and community involvement,” says J B Singh, the district magistrate of Gonda. “It is more like a dream for me,” says Khaimul Nisha, a 72-year-old villager from Virahmatpur gram panchayat of Wazirganj block. “My son who is a farmer has been trying to build a toilet for long. He registered for financial support last year in November. This year we were lucky enough to get our name in the list. Soon we will get rid of the shame of going out,” adds Nisha. The district officials guaranteed to finish the toilet construction along with the twin pits for the management of black water coming out of the toilets by March 30. Saroja Devi, another beneficiary from the same village says that normally it takes around a month to complete toilet construction work in her village due to the unavailability of skilled labour and construction material. But since her toilet construction is taking place under the district government’s special toilet construction drive, she is optimistic about the completion of construction work in the scheduled time of five days. “My daughters will no longer go through daily discomfort. We will soon get rid of this daily shame of going out. We will get our own toilet in just four days. I have waited for this day since long,” says Siyapati, a 37-year-old woman from Chappia gram panchayat, whose toilet is under construction. In most of the villages it is common to see residents engaged in digging pits, carrying bricks or cement or supervising toilet construction. As many as 230,000 individual household toilets have been constructed in the district so far since the initiation of SBM (rural). “In our village only half of the villagers have toilets in their household. People barely meet the essentialities of normal living. Building a toilet is a kind of luxury for most villagers. Toilet construction is only in their wishlist, which will not happen without external support. The local administration came forward with financial help and the response from the villagers is receptive,” says Fatima, sarpanch of Khorhansha gram panchayat of Jhanjhari block. Prior to the massive drive, the household toilet coverage in Gonda was just below 40 per cent and it climbed to 46 per cent in just one week of the recent construction phase. Gonda district has always been a back bencher in terms of sanitation. According to the 2011 Census, the district showed that 91 per cent of the rural population, which contributes 70 per cent of the population in the district, opted for open defecation. After the launch of SBM in 2014-15, the rate of toilet construction in the district picked up and around three times more toilets were constructed. The rate peaked in 2017-18, where around 21 times more toilets were constructed compared to pre-SBM. Brijesh Kumar Srivastava, the SBM (rural) coordinator of Gonda, explains that the poor progress in household coverage of toilets was basically due to poverty. “In the first phase of SBM, we mobilised the community and tried to sensitise them about the ill-effects of open defecation. It was not an easy task. We contacted each and every beneficiary and cajoled them to construct toilets by explaining the negative health impacts. The residents were finally convinced that the obnoxious practice contributed to bacterial infections and gastrointestinal disorders resulting in the loss of income for family members and huge expenditure on curing illnesses,” says Srivastava. But the manner in which the money of Information, Education and Communication (IEC) was spent differed according to district officials and the Ministry of Drinking Water and Sanitation (MDWS). The district had spent over I1 crore on IEC in the last two financial years, according to MDWS data of March 2018. The district officials say they had spent it on wall writings, hoardings and banners. This does not tally with the MDWS data of March 2018. According to MDWS data, the money was spent in “others” category, which was not explained. “Luckily, the response received from residents was very positive due to IEC,” says Srivastava. People liked the idea of building toilets as there is barely any space available to defecate in the open. People, especially women, suffer massively due to this. They need to wait for long hours to relieve themselves. This often leads to a situation of shame and disgrace for them. “We have seen an exponential increase in toilet demand and huge number of applications,” adds Srivastava. But what demotivated the residents in the early phase of SBM was the cash flow. Hence, Mission 32 was launched where cash flow was made easy. This is not the first time such a rush for toilet construction has happened in India. A construction of 8,000 toilets in Udham Singh Nagar district in Uttarakhand in just 480 hours saw the district enter the Limca Book of Records in 2016. 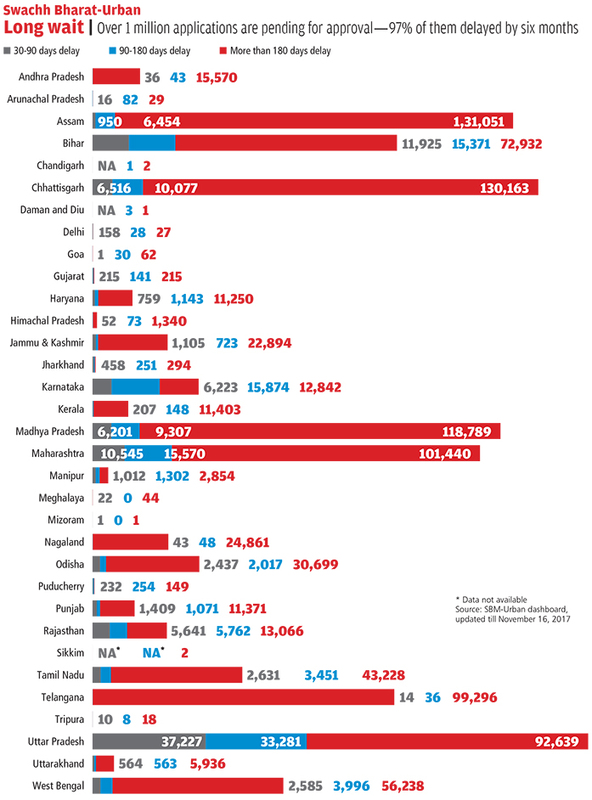 Peramnalur district in Tamil Nadu was not far behind. It had built over 4,666 household toilets in just 48 hours in February 2017. 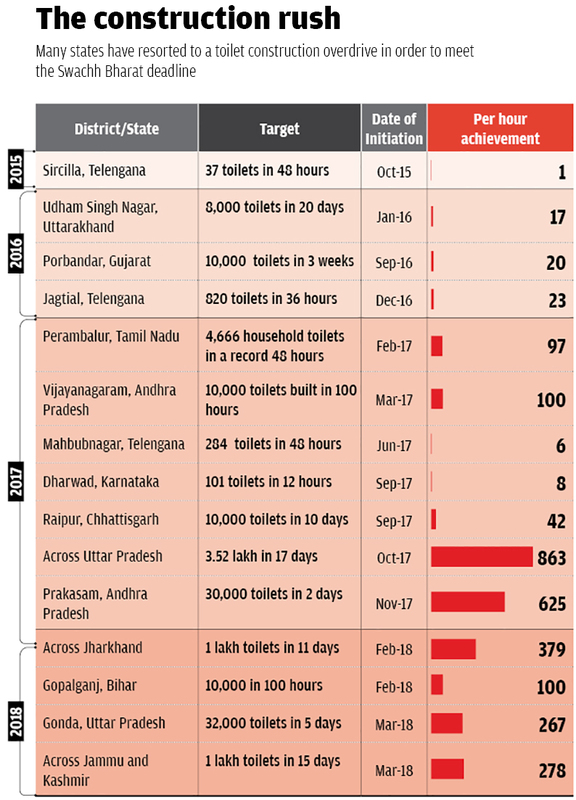 The most striking initiative was in Vizianagaram district in Andhra Pradesh where 10,500 household toilets were constructed in just 100 hours in March 2017. This inspired the district of Prakasam in the same state and 30,000 toilets were constructed in 700 gram panchayats in just 48 hours. Many districts in Chhattisgarh and Jharkhand also embarked on a toilet construction spree ( see ‘The construction rush’). Deepak Sanan, former additional chief secretary, government of Himachal Pradesh, rejects the construction-focused model in favour of a strategy aimed at creating community demand for toilets. Ending open defecation rather than constructing toilets should be the goal. According to him, the presence and absence of toilets has now become the measurable tool for sanitation. There have been several examples which failed to trigger the communities to use toilets. Thus there is increase in toilets, but it is a very small step towards making a state open defecation free. The district of Gonda, according to MDWS, had over 25,000 dys-functional toilets as on March 26, 2018. The district officials lay the blame on previous programmes that could not motivate people to use toilets. Under SBM, only 1.7 per cent toilets were converted to functional ones. Therefore, the villages need to look into the remaining 24,000 dysfunctional toilets. The district’s plan for solid liquid waste management is still awaited, according to district officials. Till date, nothing had been spent on it. The present construction involves a twin pit system, where the depth of the pit is 1 metre below the ground. Gonda district has no dearth of groundwater reserves. The groundwater brochure of the district by the Central Groundwater Board says that the groundwater at most of the blocks is shallow. The pre-monsoon depth of the groundwater varies between 3 to 5 m below the ground level and in the post-monsoon, the groundwater level rises to 1 to 3 m below the ground level. Thus the pits may interfere in areas of shallow groundwater level. The Central Ground Water Board report also talks about waterlogged areas in the district. Hence blindly following twin pits will not be a solution for tackling black water. Gonda district will have to build 20 toilets per hour to achieve its target by October 2019 of 100 per cent household coverage. Recent drives like the Mission 32 can make the target achievable, but will this bring about a true open defecation free status is a question that only time will tell. 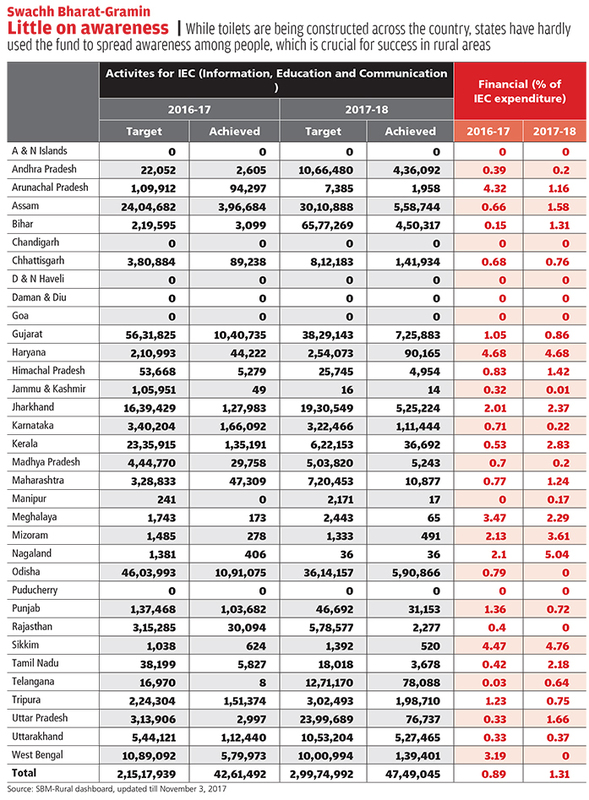 Will the world miss SDG target because four states in India are underperforming? Every monsoon, the toughest challenge for the residents of Rahimpur Uttari village in Bihar’s flood-prone Khagaria district is to attend to nature’s call. Everyone must wake up before the dawn breaks and find a raised area for oneself. “It is very difficult for women,” says Mohit Yadav who empathises with the problem of his wife and teenaged daughters. It is not that Rahimpur Uttari does not have toilets. The village has many toilets built under the Swachh Bharat Mission (SBM), but they are of no use. Rahimpur Uttari is located on the banks of the Ganga. So, the contractors built the toilets four feet above the ground keeping in mind the regular floods here. But they made the mistake of making the soak pits at the flood level. “During monsoons the soak pits overflow rendering the toilets unusable,” says Yadav. Prime Minister Narendra Modi wants to make India open defecation-free by October 2, 2019, the 150th birth anniversary of Mahatma Gandhi. As SBM moves towards its deadline, government officials are in a toilet-building spree. They want to quickly make toilets in all the houses in Khagaria and declare it open defecation-free. Whether the toilets are usable or not is not a concern. Villages like Rahimpur Uttari will not only determine India’s tryst with total sanitation, but also decide whether the world can achieve Sustainable Development Goal 6. SDG aims to make the world open defecation-free by 2030. India needs to build one toilet each in 64 million households to at least cover all the households under SBM, and to officially declare the country open defecation-free. According to a 2014 report of the United Nations, out of the world’s one billion people defecating in the open, 60 per cent live in four states of India—Bihar, Uttar Pradesh, Odisha and Jharkhand. Compared to other states, progress here is the least under SBM. In Bihar, about 70 per cent of the households do not have toilets, 59 per cent in Odisha, 54 per cent in Uttar Pradesh and 47 per cent in Jharkhand, shows the Ministry of Drinking Water and Sanitation website, accessed on June 19, 2017. So, of the total number of toilets the country needs, almost 57 per cent are in these four states. The country’s situation is worse than what the ministry’s data shows. This is because toilets that exist are old and dysfunctional. The ministry correlates the number of households practising open defecation to the number of households that have toilets. It does not consider whether the toilets are functional or not. India has 7.9 million dysfunctional toilets. Of this, 0.82 million are in Bihar, 0.68 million in Jharkhand, 0.21 million in Odisha, and 1.6 lmillion in Uttar Pradesh. These toilets need total reconstruction, or massive repair work to make them usable. It’s not that the government is making no effort in this regard. But the work is slow, and it is slower in these four states. As many as 0.48 million dysfunctional toilets have been made functional in the past six years. But only one to two per cent of these are in Bihar, Uttar Pradesh, Odisha and Jharkhand. So, will the world miss its SGD target because four states in India are underperforming? What is putting the brakes on the progress of the four states. 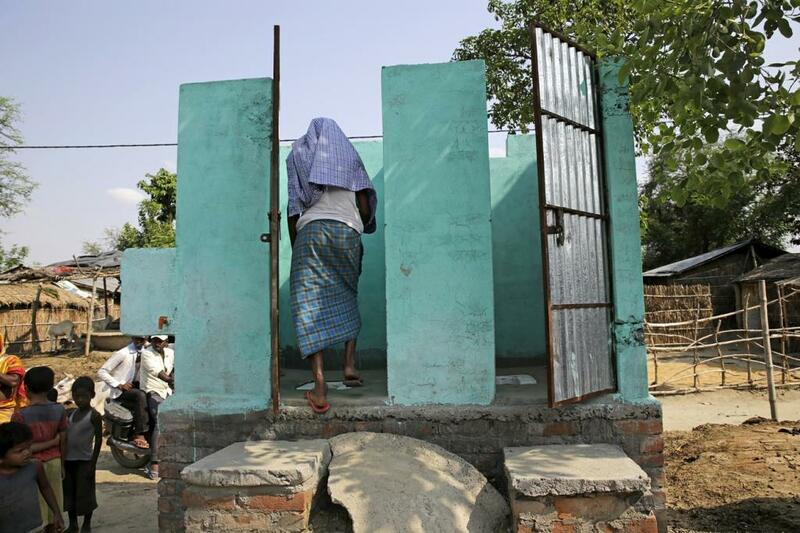 The Bihar government is in a tearing hurry to make toilets. Under SBM, 71 per cent of its 20.2 million households need toilets by October 2019. As many as 1.6 million toilets are ready; half of these were built last year. But has Bihar adopted total sanitation in letter and spirit? Ground reality shows the state may get the coveted open defecation-free tag, but people will remain without toilets. Lallan Kumar Singh, sarpanch of Shihma gram panchayat in Begusarai district, says more than 80 per cent households in the village got toilets in the last six months. The panchayat constantly pushes people to change old habits and start using toilets, says Singh. But it has failed to convince people. Down To Earth reporters saw that open defecation continues as in the past. The number of households where toilets is used is minuscule. This is possibly a state-wide phenomenon. Many people hesitate to build toilets because of financial constraint. 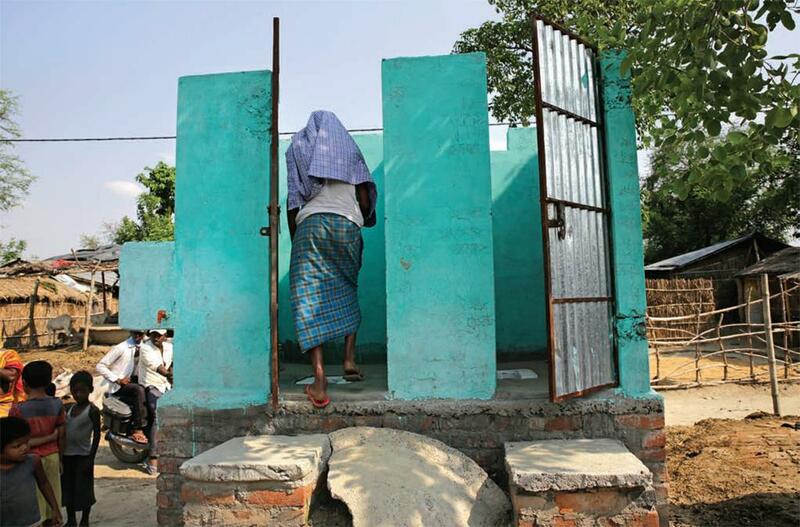 Bihar used up 99 per cent of the budget it received to make toilets. This is in sharp contrast to the 0.18 per cent of the budget it used on Information, Education and Communication. Yet, many villages remain deprived of SBM funds. Panchayats like Shihma are lucky as they are located close to the Ganga. Such villages are under the Ganga Mission, and get priority in building toilets. The state government launched Lohia Swachh Bharat Mission (LSBM) in 2014 for villages located away from the Ganga. Under this scheme, people get funds to build toilets only when their entire ward becomes open defecation-free. In Begusarai, only 20 per cent of the beneficiaries got money to make toilets. 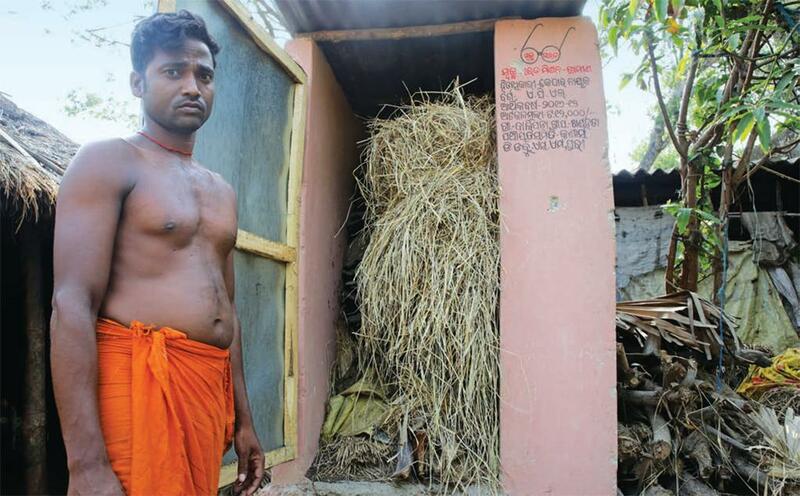 Sada Devi, 45, of Ramdiri-II panchayat in Begusarai spent R18,000 to make a toilet in her house. “I have not received any help from the government. Officials say I will not get the money until all the households in my ward have a toilet,” she says. Begusarai-based non-profit Golden Human Right Organisation constructed a number of toilets in the district. But most beneficiaries were unable to return the money as they did not get anything under LSBM. Such reasons dissuade people from building toilets. Even at places where toilets are being built on a war footing, there is little understanding on site-specific liquid waste management. This threatens to render the toilets unusable and lead to contamination. Maithani block in Begusarai district is located close to the Ganga. “Soak pits are built 5 to 6 metres below the ground, interfering with groundwater,” says Prem Sagar Mishra, block development officer of Maithani. Water for toilets is taken from shallow handpumps close to soak pits. When it rains, handpumps as well as soak pits get submerged. Faecal matter gets mixed with water and contaminates it. Rahimpur Uttari, Rahimpur Dakshin and Rahimpur Madhya in Khagaria are also on the Ganga floodplains. Every monsoon these villages get waterlogged for 10 to 20 days. The Ministry of Drinking Water and Sanitation has announced Khagaria an open defecation-free district. Every house here has a toilet. But the situation is no different from Begusarai. SBM officials do not use local knowledge on toilet location, and ways to avoid contamination. Instead, they hire contractors to build toilets, says Mishra. The objective of attaining total sanitation gets defeated. Shailendra Kumar, district coordinator of Khagaria, is very strict about the specifications of soak pits in shallow groundwater areas. The soak pits contaminate groundwater, but Kumar does not want to change the design. He complains that if people get the chance they will use other designs for liquid waste management. Bihar’s Annual Implementation Plan 2017-18 shows that last year the state’s focus was on liquid waste management. It has initiated steps on solid-liquid waste management in Sitamarhi, Nawada, Gaya, Bhagalpur, Bhojpur and Nalanda districts. The pilot project will be launched in Bhui village in Nalanda. Following this, a detailed project will be chalked out. In 2016-17, Bihar received R14,868 lakh from Central fund and R9,882 lakh from state fund for sanitation programmes. From this huge amount, the state had not spent anything on solid-liquid waste management till June 2017. As Bihar focuses only on making toilets, it fails miserably on several other sanitation fronts. The state barely has any public bathing space, resulting in several harassment cases. Women in rural areas are forced to take bath and even change sanitary napkins in public. Almost 55 per cent women take bath in the open, according to a report prepared by Ahmedabad-based non-profit Self Employed Women’s Association in 2014 on the challenges of maintaining hygiene in Bihar. About 38 per cent women do not have a private place to change sanitary napkins. School-going girls find this especially difficult, and more than 50 per cent of them miss schools due to this. 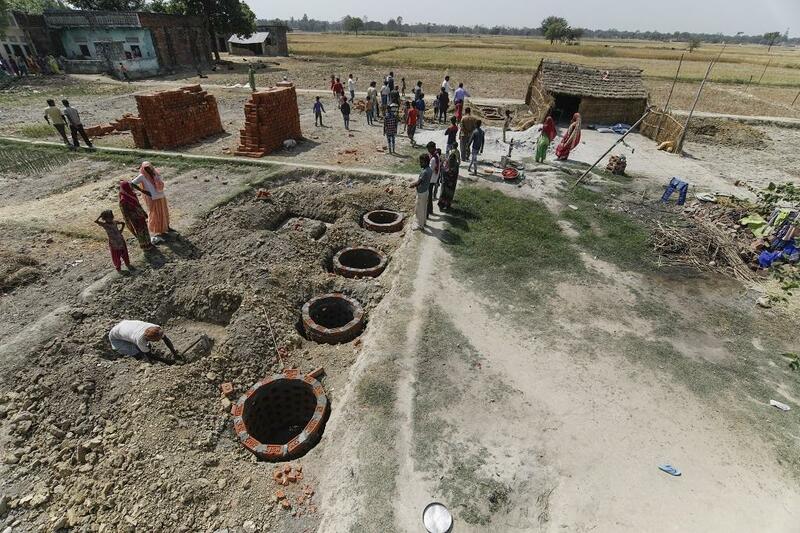 The most populous state of the country is a step ahead of Bihar in the race to build toilets. Chief Minister Yogi Adityanath has declared that Uttar Pradesh will meet the SBM target a year before Prime Minister Narendra Modi’s deadline. Obviously, there is a mad scramble to build toilets across the state. 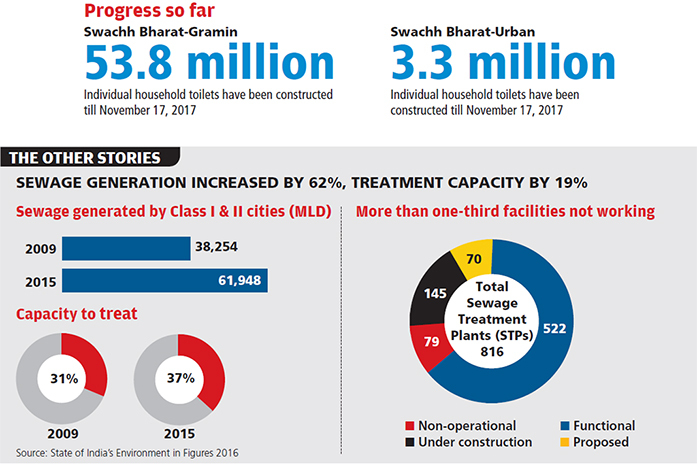 To meet the grand official target the pace of construction peaked in 2016-17, with around 1.74 million new toilets. At present, 54 per cent of the 27.3 million rural households in the state do not have toilets. But there is a big mismatch between what people demand and how the government responds. Seventy-two-year-old Masoor Ali is a differently-abled resident of Jagdishpur village in Raebareli district. Eager to build a toilet at home, he gave an application to the government authorities and asked his sons to dig a 10-feet deep pit as per the official design. “Six months went by, but neither the SBM officials came nor did any funds,” says Ali. His family does not have money to complete the toilet. When his two-year-old grandson fell into the pit, he decided to close it though the child was rescued. Incidentally, Congress President Rahul Gandhi has adopted Jagdishpur. Mahadevi, sarpanch of Jagdishpur, accuses people of using the funds meant to build toilets on other things. “We often call people for sensitisation programmes and organise awareness campaigns, but these have been of no use,” she says. On the flip side, Jitendra Singh, gram panchayat officer of Deeh block, claims there are instances where residents have been forced to give a part of the SBM fund to the sarpanch. He also says that people use the fund for other purposes. Many residents stop work on the toilet after they get the first instalment of R6,000. They dig the pit, necessary to get the first instalment, and then close it soon after money comes in their hands, he says. Despite many hurdles, Hapur has managed to register an impressive progress. With 84 per cent toilet coverage, the district may soon be open defecation-free. “This is because the work done in last two years here is purely demand-driven,” says Renu Srivastava, Hapur SBM coordinator. The adoption rate is very high here. The reason for this is hassle-free fund transfer directly to the beneficiary’s bank account. Now, people come with the demand to build more than one toilet in their houses, claims Srivastava. SBM officials cannot refuse such a demand, but its acceptance can deprive other beneficiaries, she says. In Uttar Pradesh, the clean Ganga project drives SBM. The mission’s officials are under pressure to build toilets near the Ganga. Like in Bihar, villages along the banks of the river get priority. The Ganga’s largest stretch runs through Uttar Pradesh and is also most polluted by raw sewage flows. But again, like in Bihar, solid-liquid waste management hardly gets any attention here. Gouraha in Amethi district is an open defecation-free village. Sixty-two-year-old farmer Gaya Prasad says very few people in the village use toilets. The sarpanch controls the money allotted for toilets and constructs them without consulting people, he says. Other residents say the poor quality of construction can be seen everywhere. Jhansi is keeping a steady pace to achieve the open defecation-free status. As many as 57 per cent households are covered by toilets. But the concern here is very different from the other districts. Jhansi is a water-deficit district. This minimises use of toilets during summers. During the recent consecutive droughts, people chose to defecate in the open instead of using the newly-built clean toilets in their houses, says Rajeev Hingwasia, SBM coordinator of Jhansi. Bihar, Uttar Pradesh and Odisha compete with each other in displaying poor sanitation, says Kamal Kar, founder director of Kolkata-based non-profit CLTS Foundation. Out of 9 million rural households in Odisha, only 40 per cent have toilets. Like in Bihar and Uttar Pradesh, a toilet in an Odisha home does not ensure the house is open defecation-free. Khandahota in Puri district will soon be declared open defecation-free, but the toilets in the village are used mostly to store fodder. Residents say the toilets are badly constructed and cannot be used. “There is no quality check. We cannot even decide the location of the toilet,” complain most residents. The reason why people do not use toilets is completely different, says sarpanch Dhable Sur Naik. “People get water from tankers. There is hardly any water to drink, why will people spare water for the toilet?” Odisha has spent all its funds under SBM, but has used only R30,000 on solid-liquid waste management. The state typifies the way SBM is being handled across the country. The focus of the programme is on building toilets; inherent requirements such as solid-liquid waste management have been relegated and people’s voice is left unheard. People in the villages that Down To Earth visited said the programme had turned into a target-chasing exercise. There is no emphasis on changing people’s habits, or ensuring at least functional toilets. “People should have been made aware of the benefits of using toilets before building them, but the reverse happened here,” says Rama Panda, sarpanch, Harekrushnapur panchayat. “The programme is not demand-driven,” says Panda. The pace of toilet construction is too fast. It leaves us with no time to organise awareness campaigns, complains Tapaswani Chaudhary, SBM consultant in Cuttack. 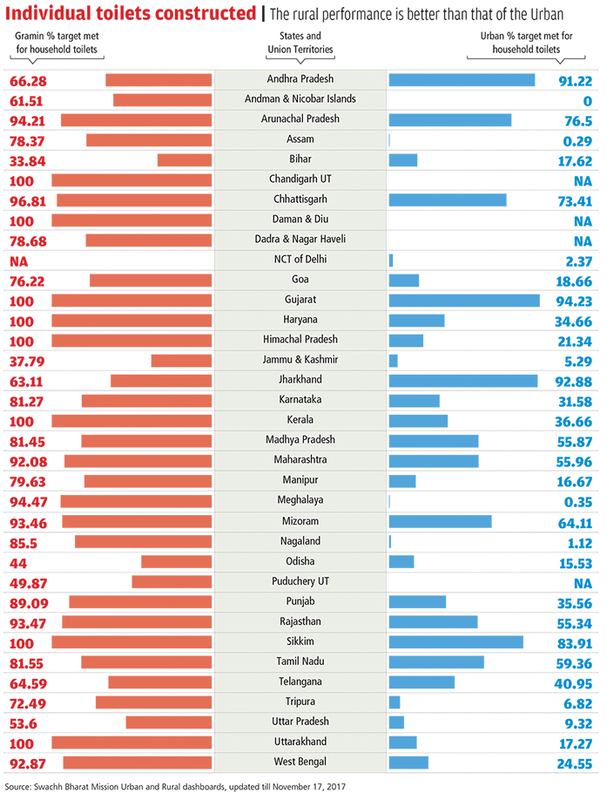 Although staggering, Jharkhand is performing better than Bihar, Uttar Pradesh and Odisha. About 53 per cent of the households already have toilets. Till January 2017, awareness campaigns were organised in 73 per cent of 4,402 gram panchayats, shows Ministry of Drinking Water and Sanitation data. This is a big achievement considering awareness campaigns are non-existent in Bihar, Uttar Pradesh and Odisha. Compared to these three states, Jharkhand records higher rate of construction and toilet use. “The state will have 100 per cent toilet coverage before 2019,” claims Chandra Prakash Choudhary, Minister of State for Water Resources, Drinking Water and Sanitation. But Jharkhand, too, also falters in spending money on solid-liquid waste management. Till January 2017, it did not spend anything on this. However, it has initiated steps in this regard. The state’s Annual Implementation Plan for 2017-18 shows it has developed seven Detailed Project Reports (DPRs) under Neer Nirmal Pariyojana. As many as 32 DPRs on solid-liquid waste management in gram panchayats have been developed under Namami Gange Programme. Neer Nirmal Pariyojna has been launched in Assam, Jharkhand, Uttar Pradesh and Bihar to provide drinking water and to maintain sanitation in rural areas. It is supported by the Ministry of Drinking Water and Sanitation, and the World Bank. To further boost solid-liquid waste management, Jharkhand is developing DPRs in gram panchayats that are open defecation-free and have piped water supply schemes. Ramgarh is the first district in Jharkhand to be open defecation-free. It sets an example to show how community involvement and strategic thinking can make an impact. The district has a rocky terrain and is mineral-rich, but it also suffers from acute water scarcity. This makes toilet use a difficult proposition. This apart, most residents are poor and cannot afford construction and maintenance of toilets. Therefore, the district authorities took a conscious decision to use SBM funds only for the poor and the needy. It launched an extensive drive to identify the rich and rectify the base line survey of 2012. Names of the rich were removed from the beneficiaries’ list and replaced with those of the poor. The district authorities worked with the community on water security plans. A strong administrative will and good coordination between people and SBM officials helped the district to not only construct toilets but also ensure its use in a sustainable manner. The district administration initiated programmes such as Ratri Choupal, Ratri Vishram, Prashasan Aapke Dwar, Lota Pani, Nukkad Sabha, and Sanitation Week to sensitise the community on sanitation problems. District collector Rajeshwari helped women take the lead in various village meetings. “There were about 15,000 defunct individual household toilets in the district. These were covered by District Mineral Foundation (DMF) fund and the MLA fund,” says Prabhu Dayal Mandal, executive engineer, Public Health and Engineering Department, Ramgarh. In many villages, beneficiaries undertook labour work to ensure proper construction. To take the drive farther, the district is now making a DPR for solid-liquid waste management, says Ram Kumar, district SBM coordinator. Statistics show the four states of the country are poor failures in sanitation. Lakhs of dysfunctional toilets here expose the sad state of affairs. To understand SBM’s progress, UNICEF and the Ministry of Drinking Water and Sanitation organised a meeting in May 2017. In this, former member secretary of the Planning Commission N C Saxena said that the condition of toilets in these states is such that one cannot differentiate between an unfinished toilet and a dysfunctional one. He also asked who was involved in the construction of toilets. The quality of construction in Bihar and Odisha is poor at places where village heads do not involve beneficiaries. Mostly, the sarpanch who controls SBM hires contractors to construct toilets. Ramgarh shows the way as it builds toilets by involving the stakeholders. It uses DMF fund to make dysfunctional toilets functional. Evidently, good coordination between stakeholders, village heads and SBM officials has resulted in high rate of toilet construction and its use, and easy flow of funds. Hapur has brought about changes as district and block level officials work hand-in-hand. In Jhansi, people opt for open defecation because of scarce water during lean season. But Ramgarh, also a water-stressed area, has worked on its water distribution system to resolve sanitation problems. The district shows that alternatives worked out at the village level can help come out of crisis of resources such as water, land, or even funds. The poor economic condition of the people of Mehulia village in Odisha was stopping them from building toilets. The panchayat took the initiative to invite a non-profit to provide them with affordable toilets. In Odisha, the administration failed to explain to the people the relation between sanitation and health. Although 99 per cent of the funds here has been used to construct toilets, women and children suffer because of waterborne diseases. In Jharkhand’s Kuru block, Mahila Mandals (women’s associations) explain to the people the connection between health, sanitation and women’s dignity. They motivate people to use toilets. Ganjam district in Odisha has gone a step ahead and built bathrooms along with toilets. This helps women take bath and gives them the space to change sanitary napkins. There is little understanding on wastewater management among people. Whatever little work has been done is incorrect. Contractors stick to one design of the soak pit, irrespective of the area being dry or flood-prone. Saxena says the technology should not only be affordable but also according to the soil conditions. There is a tendency to build huge chambers where solid and liquid from the waste is collected, he says. This is because of the poor understanding of the beneficiaries. Contractors emerge the winner as they manage to extract extra money from them. The four states show maximum progress on building toilets in 2016-17. So, monitoring it completely is difficult at present. However, SBM should not be monitored considering the number of toilets built; it should be outcome-based, states a 2016 research of the Delhi-based non-profit Centre for Science and Environment (CSE). There should be well-developed communication and education materials for advocacy. Trained Village Water Sanitation Committees should not only create awareness, but also ensure construction of toilets. The wastewater generated must be treated, reused and recycled, states the CSE research. At present, the stark reality of sanitation in the country challenges the goal the world has set for itself. Given the progress in the past decades, the task seems tough.